Laptop Hanging Problem Repair in Hyderabad and Secunderabad. Computer, MacBook, Laptop Freezing / Notebook Stucking Issue Fix, For HP, Dell, Lenovo, Apple, Acer, asus, Sony Toshiba Notebooks at best price. Your laptop is freezed or Laptop hanging continuously. 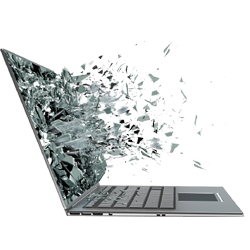 Laptop not working do not worry, just log on to laptop repair world and we find the best solution for your laptop at best price . We provide free pickup and delivery of your laptop. you just need to fill up online form or call us for instant feedback from our side. Our quality technical team is always ready to take your command to provide the best service in the industry. Get in touch with our quality technical support team to get the best out of your laptop, we guarantee to provide you quality service at low price with discount on all brands of laptop. We are not going to charge anything during inspection or no hidden charges. The inspection will be free of cost by our technical experts, that will be thoroughly check up of your laptop before repairing. There will be assured money back if you are not convinced with our service , team laptoprepaireworld always fore front of innovation to satisfy our customers in every aspects. We do not compromise in quality of our service. We provide advanced technology and quality service by our good hardware technical experts to serve the industry confidently and efficiently for a positive outcome. Madhapur, Gachibowli, Ameerpet, Kukatpally, Kondapur, Dilsukhnagar, Miyapur and Hitech City. Banjara Hills, Kphb, Lb Nagar, Jubilee Hills, Chanda Nagar, Uppal, Begumpet, Mehdipatnam and Sr Nagar. Tolichowki, Alwal, Manikonda, Paradise, Parklane, Panjagutta, ctc, Ecil, Old City and Lingampally. Balanagar, Kothapet, Vanasthalipuram, Himayath Nagar, Kompally, Abids, and Ramanthapur. Shamshabad, Tarnaka, Malkajgiri, Masab Tank, Nallagandla and Attapur.